Our 100% online OSHA Hazard Communication (HAZCOM) – Aligned with GHS training course helps employees who work near or may be exposed to any type of hazardous chemical to meet the “Employee’s Right to Know” requirement. The course is based on OSHA’s 2012 Hazard Communication Standard aligned with the GHS Classification and Labeling of Chemicals. Our online OSHA Hazard Communication (HAZCOM) – Aligned with GHS training course was designed for employees who work near or may be exposed to any type of hazardous chemical and need OSHA HAZCOM training. Employees have an “Employee’s Right to Know” about hazardous chemicals in their work environment, and are required to be trained within 30 days of being hired, and also annually in many states. This course provides training based on OSHA’s 2012 HAZCOM Standard, which was updated to align with the Globally Harmonized System of Classification and Labeling of Chemicals (GHS). For students with previous HAZCOM training, we also offer a Transitioning from OSHA Hazard Communication to GHS course which focuses on transitioning students from the 1994 HAZCOM Standard to the GHS changes in the 2012 Standard. Topics include labeling, an overview of new hazard classification requirements, and Safety Data Sheets. For more information on OSHA HAZCOM training requirements or the HAZCOM courses we offer, visit our HAZCOM Training page. This is a 100% online, fully narrated course. The training is self-paced and is taken through our state-of-the-art Online Training System (OTS), which is available 24/7. This course includes up-to-date, high quality training designed with your learning as our top priority. The course features interactive training, which combines audio and visual elements for maximum retention. The course is completed entirely online using a computer with an internet connection and is available 24/7. For your convenience, it can be completed over time, and your progress will be saved to the last section completed. We are so certain you will be satisfied with your experience, that we offer a 100% Money Back Guarantee*. Please note that this course provides valuable information which applies to the general population of employees who work near or may be exposed to any type of hazardous chemical. This course is not meant to replace company-specific or function-specific training provided by your employer on equipment use and procedures for your particular work environment. You must be trained by your employer on the specific hazardous chemicals you will be working near, as well as any additional hazards, equipment, operational and administrative controls, safe work practices and emergency plans specific to your role and workplace. The objective of this HAZCOM GHS aligned training course is to help employers meet OSHA’s 2012 HAZCOM Standard, aligned with the Globally Harmonized System of Classification and Labeling of Chemicals (GHS). 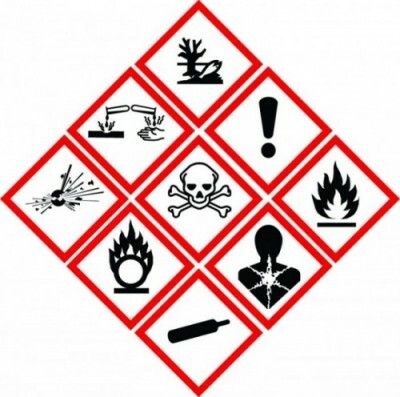 Explain the Hazard Communication Standard and the employer/employee responsibilities. This training consists of two courses, as listed below, which will be completed within our Online Training System (OTS). The sections are fully narrated and interactive. Quiz questions within each section help the student retain knowledge that will be needed for the exams. The course exam includes 10 questions, which are randomly compiled from a large pool of possible questions. A 70% or better score is needed in order to pass the exams. If a student does not pass, they may re-review information in the sections as necessary, and retake the tests as many times as needed in order to pass. This course was designed by OSHA Certified Outreach Trainers and is based on the 2012 OSHA Hazard Communication (HAZCOM) Standard, aligned with the GHS Classification and Labeling of Chemicals.